Confusion reigned on Wednesday over the practicality of legally carrying a gun in Washington, D.C., even with a permit to do so as the Metropolitan Police Department (MPD) disputed a researcher's claim that total gun-free zones extend over most of the city. John Lott, head of the Crime Prevention Research Center, said in a report that a provision in the city's gun-carry law creating a 1,000-foot gun-free zone around a number of public buildings, schools, parks, video arcades, youth centers, libraries, or public housing may apply to those with vaild gun-carry permits. "As we have previously noted, prohibiting concealed handguns within 1,000 feet of a school can in some states essentially amount to a concealed carry ban," Lott wrote in his report. "Technically, D.C. allows permitted concealed carry, but the law is written in such a way that it would ban permit holders from carrying in virtually the entire District. Even the 124 people who are legally permitted to carry are really currently banned from carrying virtually everywhere." Lott said the legality of carrying in these areas hinges on the interpretation of a confusing section on exceptions to the gun-free zones in question. "The provisions of this section shall not apply to a person legally licensed to carry a firearm in the District of Columbia who lives or works within 1,000 feet of a gun-free zone," the code reads. Lott said it's unclear who this section exempts from the disputed gun-free zones but "the most likely interpretation of the law is that you can carry in gun-free zones that include your home or business, but not in other gun-free zones that are spread across the District." 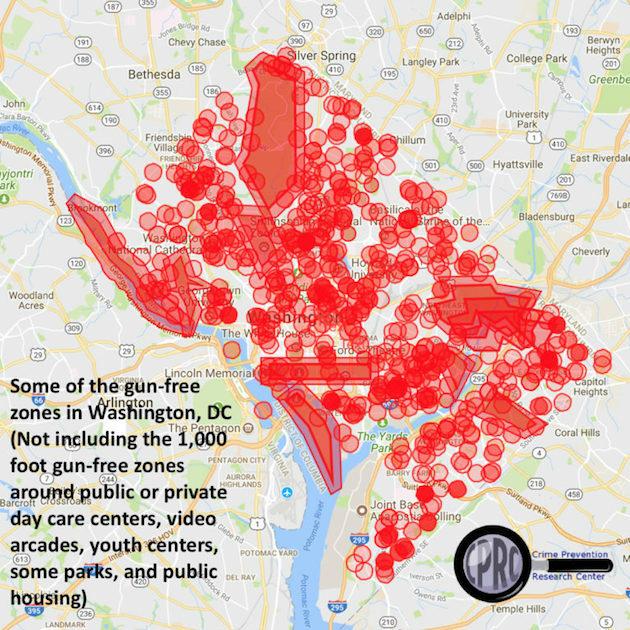 Lott created a map of the areas covered by the 1,000-foot gun-free zones combined with the other areas where guns are prohibited under the law like stadiums, anywhere that serves alcohol, hospitals, polling places, and elsewhere. In his estimation, the gun-free zones cover most of the city. "I think they just do things to try to discourage people from getting a permit and try to limit its use," Lott told the Washington Free Beacon. When asked by the Free Beacon about Lott's interpretation of the city's gun-free zone provision, the MPD first referred questions to the attorney general. "We released a Frequently Asked Questions document (available here) to advise the public on the District’s regime for concealed carry following the D.C. Circuit’s ruling," Robert Marus, a spokesman for the attorney general, told the Free Beacon. "It indicates where permit holders may and may not carry concealed handguns. We are confident in the constitutionality of the District’s remaining gun laws, and we stand by them." "The provision of D.C. Code that you’re referencing about Gun Free Zones is a penalty enhancement—not a unique crime—for someone who is illegally carrying a firearm," Rachel Schaerr Reid, MPD public affairs specialist, told the Free Beacon. "That would not apply to someone with a valid license to carry. The areas of the city where a civilian with a license to carry cannot carry are listed in D.C. Code § 7—2509.07." 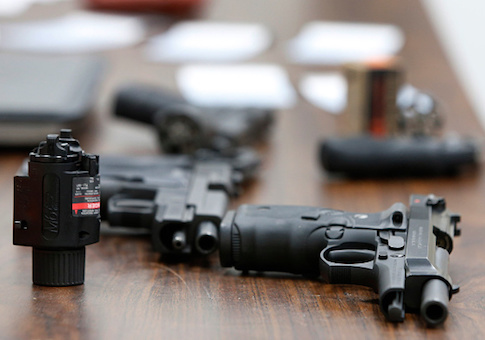 The Second Amendment Foundation, which was a plaintiff in the case against the city's gun-carry law that led to the city being forced to issue permits to qualified applicants, said it is investigating further legal action in regards to the gun-free zones. "The gun-free zones in D.C. make it very hard to carry a legal firearm for self-protection," Alan Gottlieb, the group's founder, told the Free Beacon. "Not impossible but very difficult. We are looking at possible legal action."